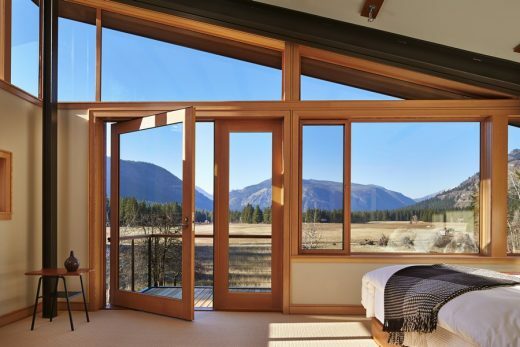 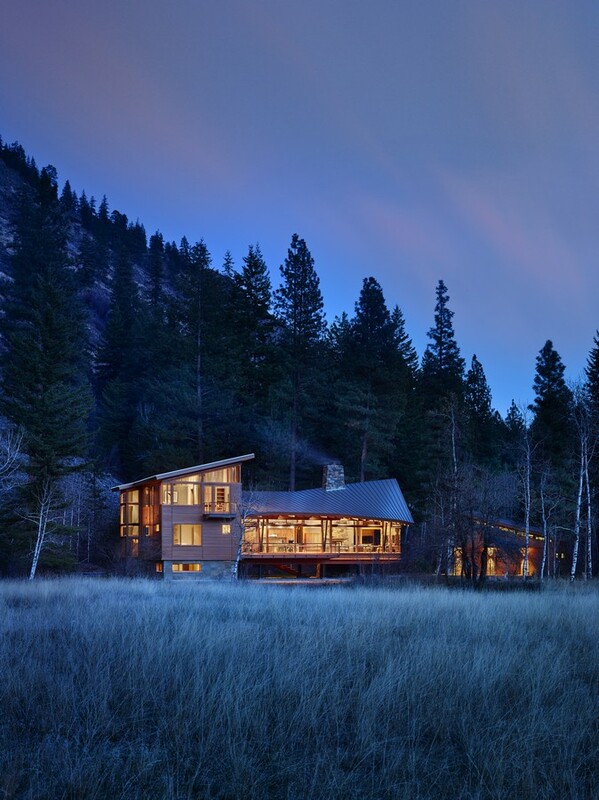 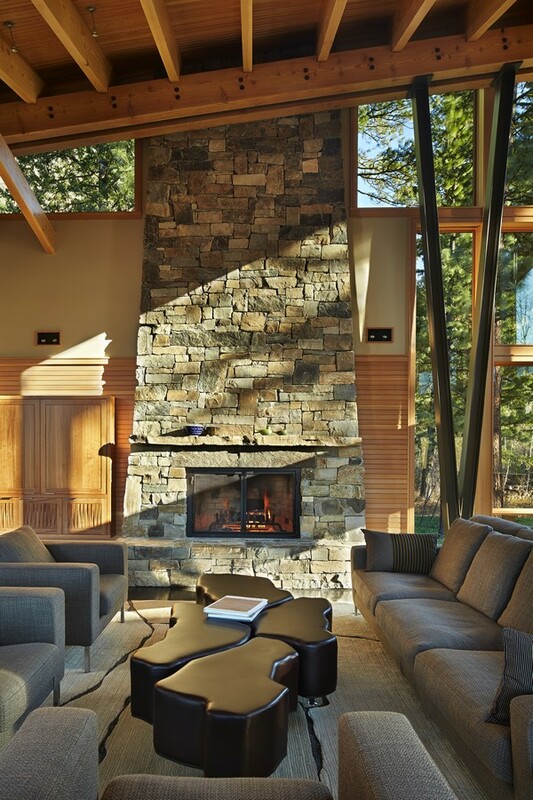 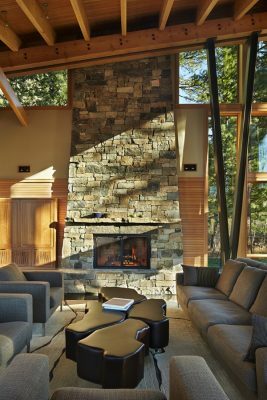 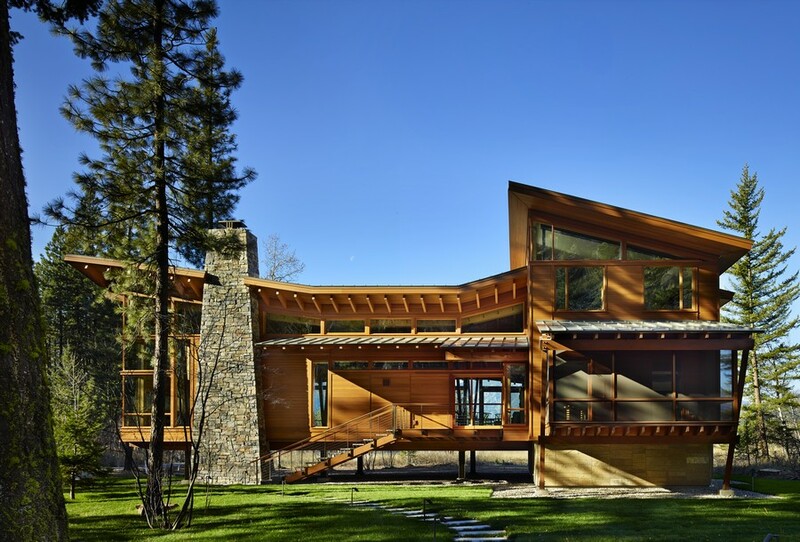 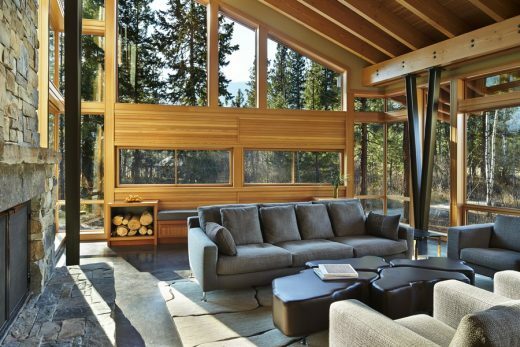 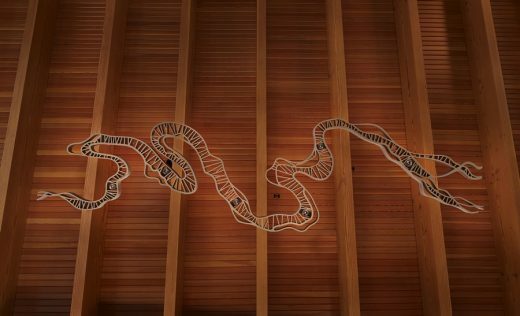 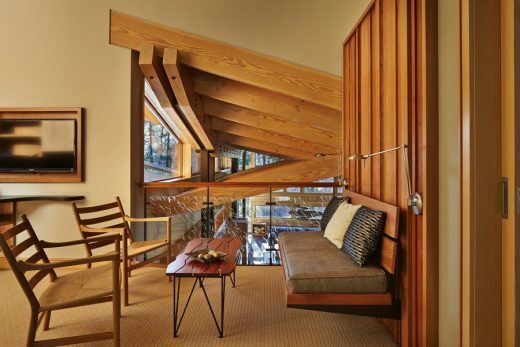 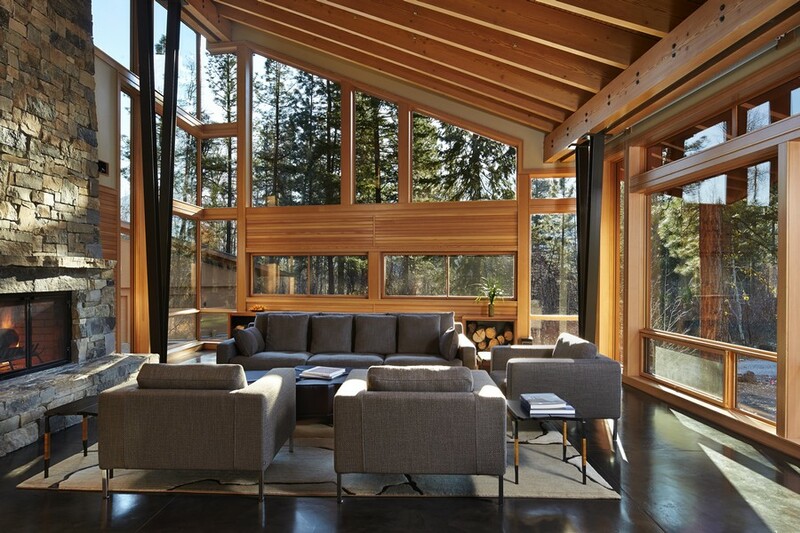 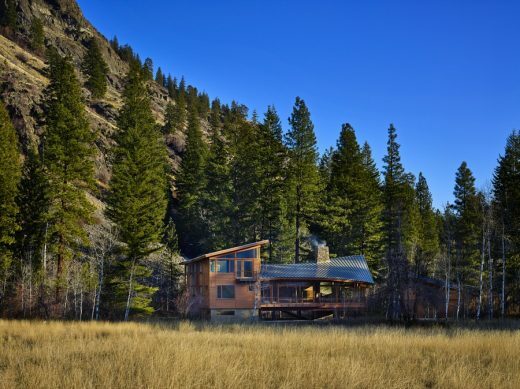 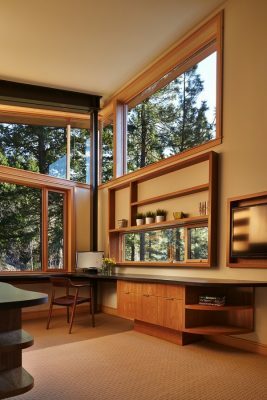 The Mazama House is located in the Methow Valley of Washington State, a secluded mountain valley on the eastern edge of the North Cascades, about 200 miles northeast of Seattle. The house has been carefully placed in a copse of trees at the easterly end of a large meadow. 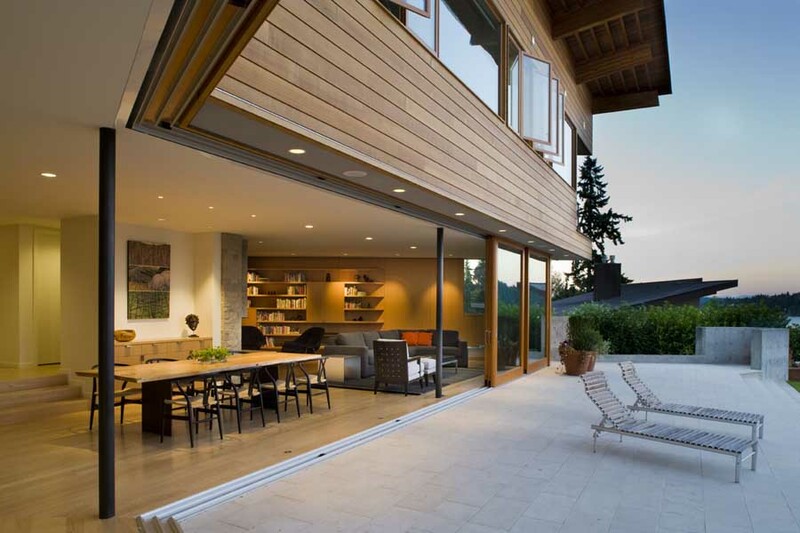 Two major building volumes indicate the house organization. A grounded 2-story bedroom wing anchors a raised living pavilion that is lifted off the ground by a series of exposed steel columns. 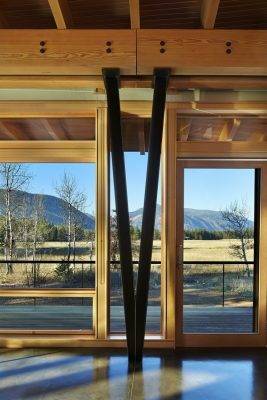 Seen from the access road, the large meadow in front of the house continues right under the main living space, making the living pavilion into a kind of bridge structure spanning over the meadow grass, with the house touching the ground lightly on six steel columns. The raised floor level provides enhanced views as well as keeping the main living level well above the 3-4 feet of winter snow accumulation that is typical for the upper Methow Valley. To further emphasize the idea of lightness, the exposed wood structure of the living pavilion roof changes pitch along its length, so the roof warps upward at each end. 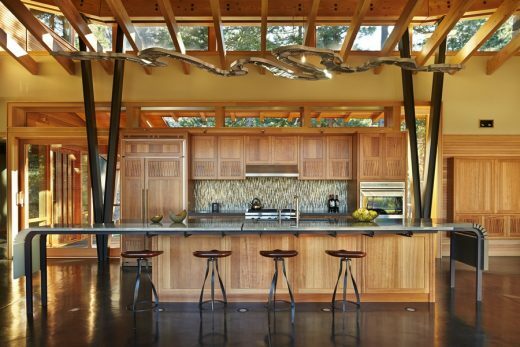 The interior exposed wood beams appear like an unfolding fan as the roof pitch changes. 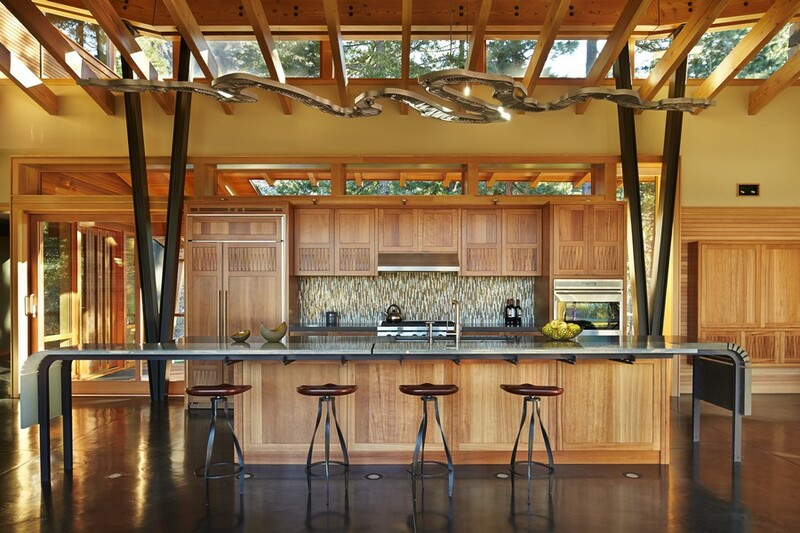 The main interior bearing columns are steel with a tapered “V”-shape, recalling the lightness of a dancer. 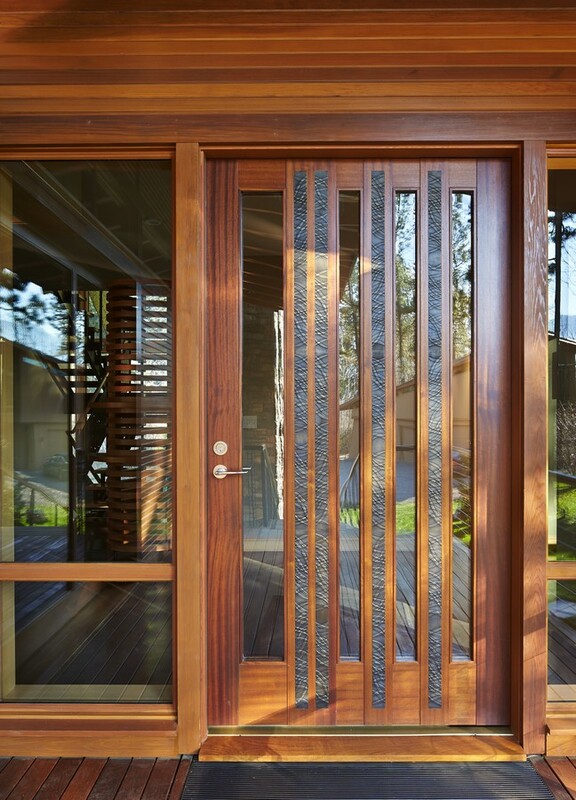 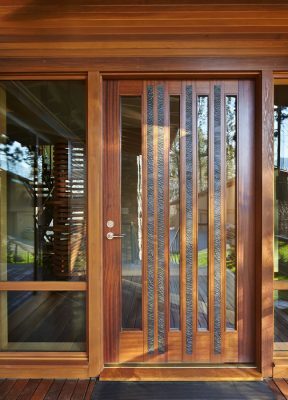 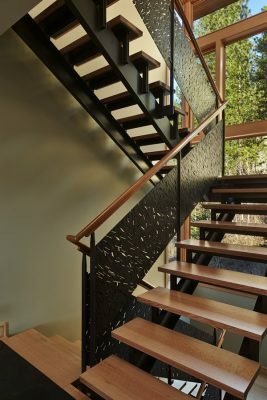 The house reflects the continuing FINNE investigation into the idea of crafted modernism, with cast bronze inserts at the front door, variegated laser-cut steel railing panels, a curvilinear cast-glass kitchen counter, water jet-cut aluminium light fixtures, and many custom furniture pieces. 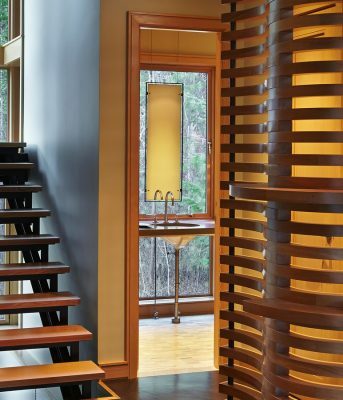 The house interior has been designed to be completely integral with the exterior. The living pavilion contains more than twelve pieces of custom furniture and lighting, creating a totality of the designed environment that recalls the idea of Gesamt kunstverk, as seen in the work of Josef Hoffman and the Viennese Secessionist movement in the early 20thcentury. 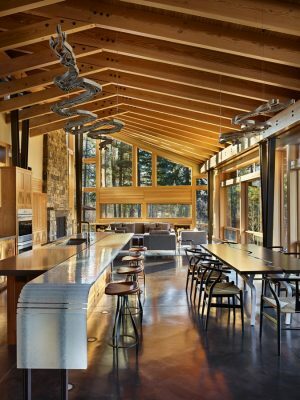 The house has been designed from the start as a sustainable structure, with 40% higher insulation values than required by code, radiant concrete slab heating, efficient natural ventilation, large amounts of natural lighting, water-conserving plumbing fixtures, and locally sourced materials. 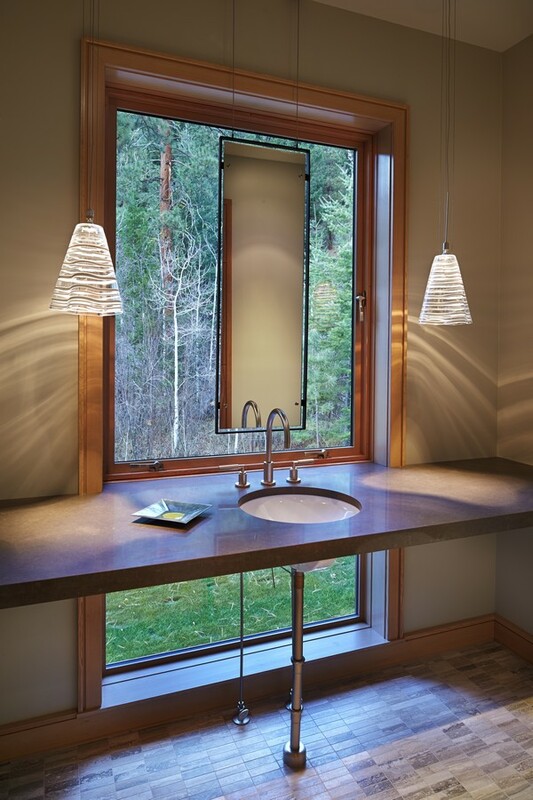 Windows have high-performance Low E insulated glazing and are equipped with concealed shades. A radiant hydronic heat system with exposed concrete floors allows lower operating temperatures and higher occupant comfort levels. 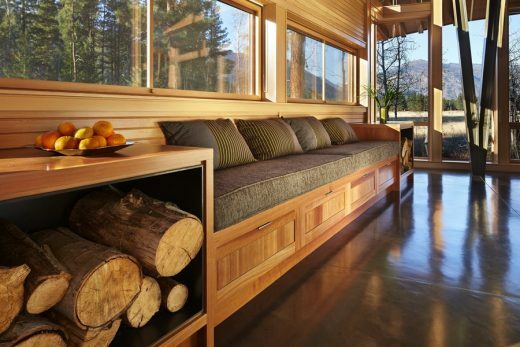 The concrete slabs conserve heat and provide great warmth and comfort for the feet. 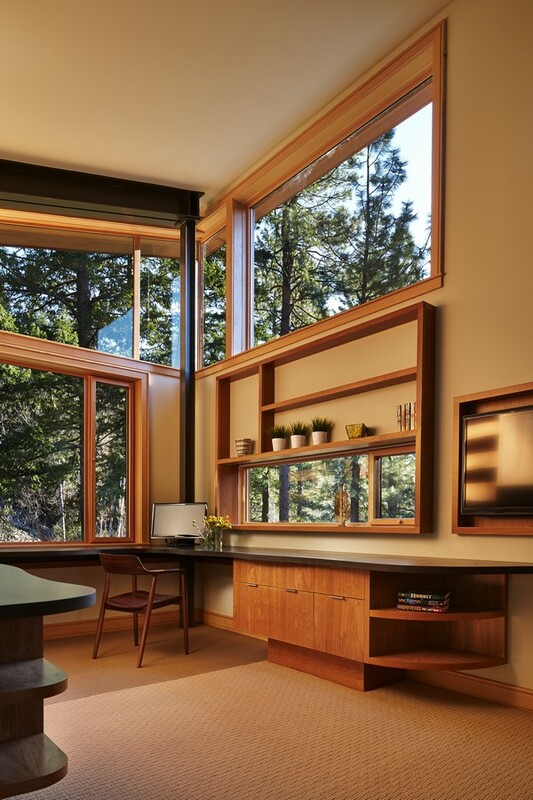 Deep roof overhangs, built-in shades and high operating clerestory windows are used to reduce heat gain in summer months. 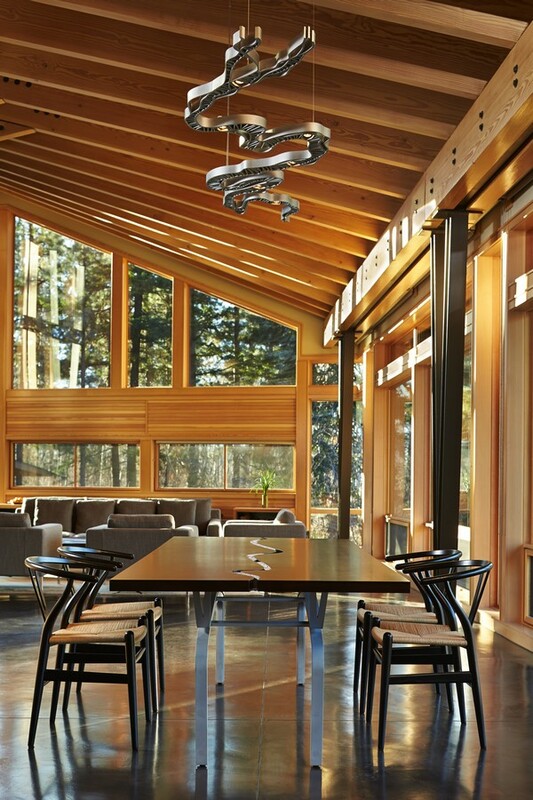 During the winter, the lower sun angle is able to penetrate into living spaces and passively warm the exposed concrete floor. 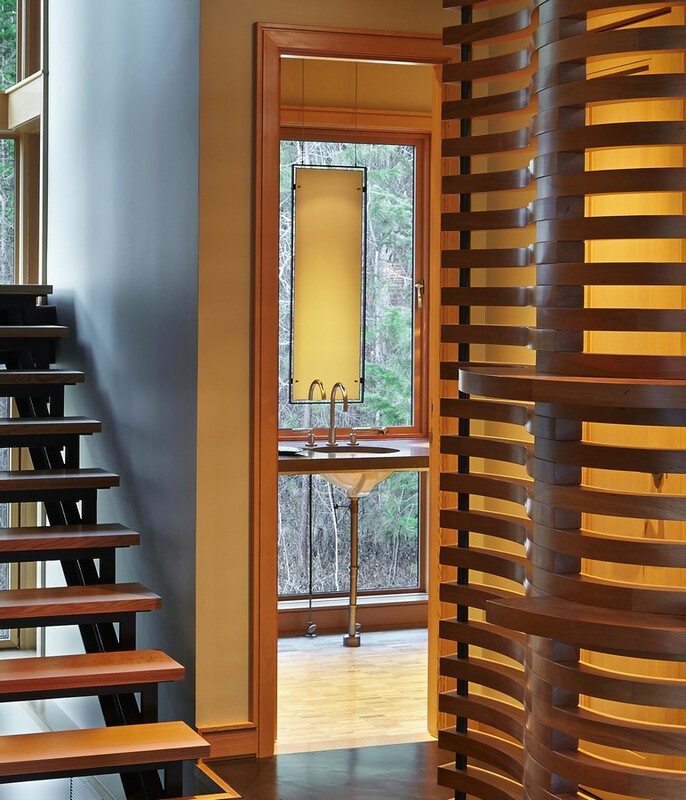 Low VOC paints and stains have been used throughout the house. 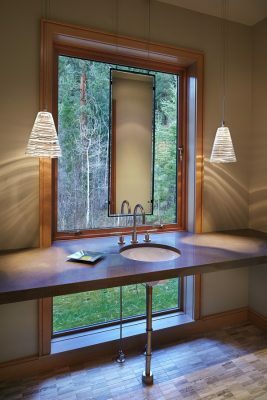 The high level of craft evident in the house reflects another key principle of sustainable design: build it well and make it last for many years!